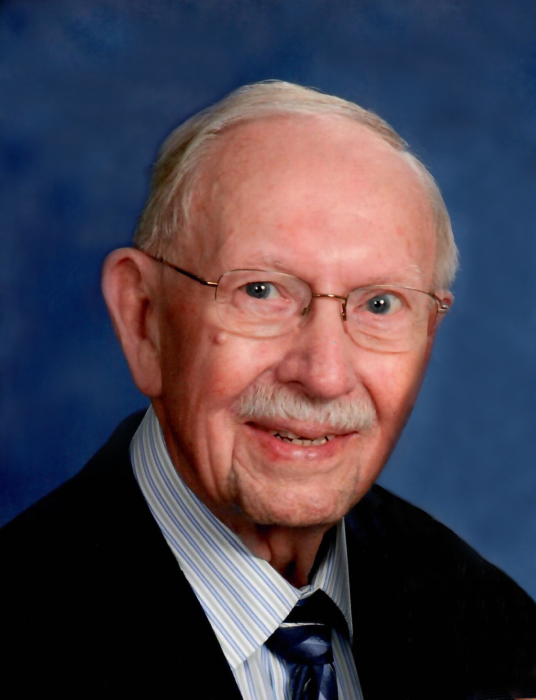 John Hermanson died peacefully the afternoon of April 14, 2019, at Sunset Drive – a Prospera Community in Mandan following a brief illness and a long and happy life. Funeral Services will be held at 10:00 AM on Saturday, April 20, 2019, at First Lutheran Church in Mandan, with Rev. Christina Martin officiating. Inurnment will follow at Mandan Union Cemetery immediately following the service. Visitation will be held from 6:00 to 8:00 PM on Friday, April 19, 2019, at Buehler Larson Funeral Home, with a prayer service at 7:00 PM. Visitation will continue one hour prior to the service on Saturday. John was born on September 17, 1932, at his family’s home in Sunny, North Dakota. He was the much adored youngest of 11 children born to Mabel Nellie (Hendrickson) and Alfred Edward Hermanson. Although raised with little in the way of material possessions, his childhood was rich with love and filled with the adventures of a boy raised in rural, small town North Dakota. John showed a talent for singing at a young age and singing became his lifelong passion. From his days with his high school barbershop quartet, through his decades as a proud member of the Bismarck-Mandan Elks Chorus, John was widely known for his beautiful voice. He sang at countless weddings and funerals in the community and, with the Elks chorus, performed solos on stages throughout the US. Music was a constant source of joy to John, and he happily shared that joy with his family and friends. John’s other abiding passion was his love for his wife, Donna Marie (nee Mann). John and Donna started dating in high school and continued to love each other as if they were young sweethearts. When people would comment about the fact that they always walked hand in hand, they would laugh and say “She’s holding me up”, “No, he’s holding me up”. The truth we all knew was, they held each other up. Together, John and Donna worked tirelessly to create a beautiful home and opportunities for their five children. John worked for local newspapers, starting his career with the Mandan Pioneer and retiring from the Mandan Finder. He held second jobs, working evenings to bring home additional income, and was paid for his performances at weddings and funerals. No matter how little money they had, John and Donna always found enough to take the family on summer vacations, to celebrate life’s pleasures, and to provide a sense of security for their children. After their children were raised, John and Donna took great pleasure in traveling throughout the US, as well as to Hong Kong, mainland China, Norway and Denmark, the Bahamas, England, Scotland, Wales, and Ireland. John is survived by his four adoring daughters: Jane (Joe) Barbeau, Los Altos, CA; Sandy Jacobs, Phoenix, AZ; Laura Hermanson, Mandan; and Karen (Tim) Kautzman, Colstrip, MT; his six grandchildren: Jordan and Jack Barbeau, Jeff and Mark Jacobs, Megan (Shawn) Alder, and Emily Kautzman; brothers-in-law, Del (Eileen) Mann, and Connie (Kathy) Mann; as well as many nieces and nephews. John was preceded in death by his parents and ten siblings; his son, Steven; and his beloved Donna. To say that John was a good and kind man would be an enormous understatement. He was the best and kindest of men; a loving and devoted son, brother, husband, father, grandfather, and friend. His loss leaves his family breathless, and yet grateful for the example he was of how to lead a truly honest, generous, and loving life. In lieu of flowers, the family asks that donations be made in John’s honor to First Lutheran Church of Mandan or to the Bismarck-Mandan Elks Chorus.